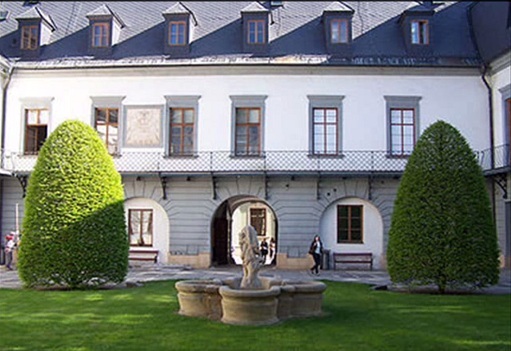 Palacký University in Olomouc is one of the oldest universities in Central Europe. Drawing on more than 400-year tradition of higher education it is nowadays a renowned centre for teaching and research. University attracts students from other European and overseas countries. With 24,000 undergraduate students on eight faculties, it provides quality education and excellent background for research in the wide range of academic disciplines. Students of medicine undertake most of their work in two neighboring institutions. These are the Theoretical Institutes Building, which houses five departments involved in the theoretical parts of the coursework, and seven departments that teach coursework in pre-clinical and clinical training; and the Faculty Hospital, a large teaching institution and hospital with some 1400 beds. The Medical Library is an integral part of the Faculty of Medicine Information Center offering access to the second largest medical book collection in the Czech Republic (about 140,000 items) as well as information databases (Ovid Medline, EBSCO Host, Proquest Medical Library, Science Direct, The Cochrane Library and Web of Science). The Library currently subscribes to a total of 450 medical journals including 250 international peer-reviewed periodicals. Palacký University has an electronic union catalogue, TINLIB, containing around 125,000 records of books from various branches of science and technology including humanities, law, theology, natural sciences, physical education, sports and medicine. The catalogue can be accessed from any networked Faculty PC. Olomouc sits in the gently rolling, fertile basin of the Morava River, in central Moravia, which forms the eastern Czech Republic. Near Olomouc lie the Jeseníky Mountains, which boast good quality skiing, hiking and camping. The climate is quite mild, averaging 25 degrees Celsius in summer and 0 in winter. The town of Olomouc - the fifth largest town in the Czech Republic - lies in the center of Moravia. This town of about 100,000 inhabitants situated on the River Morava is a traditional trade and transport hub. Olomouc became the natural center of an area known for centuries as the Haná region. The region is famous for its agriculture, light industry and beautiful countryside as well as for its historical and cultural traditions. The center of Olomouc is surrounded by a ring of colorful parks and the remains of medieval city walls. It was proclaimed a protected conservation area by the state a number of years ago. Recently, the Holy Trinity Column, the largest Baroque sculptural complex in this country (1754) was classified as a UNESCO monument. Many students may be unfamiliar with the Czech Republic, its amenities and life style. They will soon discover that the home of Palacký University, Olomouc, provides the amenities found in other Western cities of similar size. Those items and services that cannot be found here can be obtained in Prague or Vienna, both located within the distance of three-hour train journeys. The cost of living in Olomouc is much lower than in other Western cities. Expenses covering food, accomodation, and public transportation come altogether to about 500 €/month. Naturally, it all depends on the student's lifestyle and on how much he/she really wants to spend. The prices can also vary considerably depending on where you stay. This estimate does not include the price of books and other educational materials. Public transportation throughout the Czech Republic is highly developed and quite inexpensive. It may be easily utilized to take in the incredible wealth of history, architecture, and beautiful landscapes of the Czech nation. Public transportation (tram, bus) in Olomouc corresponds fully to students' needs. The University provides accommodation in the University halls of residence (cca 90 EUR/month). All resident buildings contain recreation areas, TV, internet, study rooms and cooking facilities. Lunch or dinner in the student cafeteria cost about 1–2 €. In Olomouc it is easy to rent a flat (two rooms and a kitchen) for about 300–350 €/month. Students have fitness and training centers available to them. They may also become members of university teams and make use of other university facilities, especially those at the Faculty of Physical Culture. It should be noted that athletics play an important part in student life at Palacký University. The Faculty of Physical Culture boasts extensive opportunities for recreation and competitive sports. The University owns a large sports hall, which is available for use by all students. Students may also use municipal sports facilities, e.g. a fifty-meter swimming pool and two an ice skating rinks. An excellent ski resort is located less than one hour's driving distance north of Olomouc. Olomouc also offers good opportunities for those who enjoy watching competitions. Local teams play first league volleyball, handball, and football (soccer). For a town of its size, the opportunities for social and cultural activities in Olomouc are extraordinarily rich. The town's architecture is generally acclaimed to be second only to Prague's. As the former capital of Moravia, Olomouc has a rich cultural environment of which it can rightfully be proud. Olomouc hosts the Moravian Philharmonic Orchestra, the Moravian Theatre, (which presents plays, ballet, and operas), the Art Museum, and the Regional Museum. Four cinemas, several local FM radio stations, and two town newspapers serve the region. For further activities and cultural exploration, Prague, Vienna, and Krakow lie within relatively easy striking distance. The Czech Republic is a country situated in the very heart of Europe and has a population of over 10.5 million. It borders on Austria, Germany, Poland and Slovakia. The capital is Prague with 1.2 million inhabitants.The country is naturally bordered by mountain ranges. The Czech lands are characterised by and also famous for their charming countryside, rich in forests, rivers and natural or artificial lakes, which helped, together with healing mineral water wells, to form beautiful summer and winter resorts, as well as spa areas.The climate of the Czech Republic is marked by the regular cycle of the four seasons with maritime influence. The average temperature is around 23o F (0oC) in winter and around 70o F (25o C) in summer. 1. Submit a certificate of a high/secondary school or college graduation. A copy of the certificate may be submitted during the application procedure, the original must be submitted during the entrance examination at the latest. 2. Succeed at a written entrance examination taken in biology, chemistry, physics or mathematics. The level of the examination corresponds to that of the British A-levels. 3. Pass an interview with the Board of Admissions to evaluate the applicant's motivation and other factors of relevance to his or her academic background. This interview will take place after the written examination. 4. After admission, the applicant from non-EU country must apply for a long-term visa in his/her country of residence. Please consult the nearest representative office of the Czech Republic. 5. Before registration, the student has to sign a contract with the Faculty. This contract includes also an agreement about the net tuition fee 9500 EUR a year (General Medicine) / 11800 EUR a year (Dentistry), and other rights and duties of the student, including his/her medical examinations and vaccinations. For the date and site of the entrance examination, please consult Interstudium who organize the examinations in the applicant's countries. Application forms may be requested at the address given below.